The preparation of teacher candidates is highly differentiated among teacher preparation programs across the country. With the increasing development of alternative teacher licensure (ATL) programs, these practices have been the source of considerable debate and contention. The purpose of this chapter is to: (a) provide a historical overview of teacher licensure; (b) review the literature regarding alternative teacher licensure and the needed knowledge base for teachers; and (c) discuss the role Career and Technical Education (CTE) plays in regards to ATL, as well as point out a misconception regarding the original inception of ATL. Further, future trends and implications for future research regarding ATL and the preparation of teachers are outlined. In fact, currently, every state in the country has enacted an ATL program with approximately 59,000 individuals entering teaching by way of an ATL program in 2004 (National Center for Alternative Certification [NCAC], 2007). 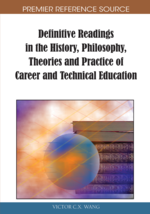 The purpose of this chapter is to: (a) provide a historical overview of teacher licensure; (b) review the literature regarding ATL; and (c) discuss the role Career and Technical Education (CTE) plays with regard to ATL. The primary emphasis of this chapter is to point out a misconception regarding the original inception of ATL. More specifically, the overwhelming majority of discussions in the ATL literature have reported that ATL has its origins in 1987 with the New Jersey ATL project. However, a deeper investigation of ATL’s historical roots has revealed that vocational education has been at the forefront of ATL since 1917 with the passage of the Smith-Hughes Act. Certification: In education, certification means possessing qualifications beyond those required for a license…certification is the process by which a nongovernmental agency or association grants special professional recognition to an individual who has met certain predetermined qualifications.